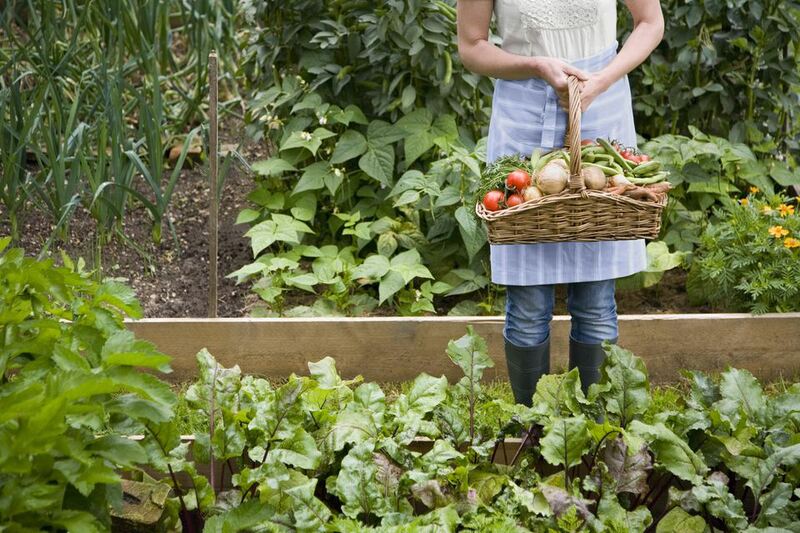 What to Consider When Planning a Vegetable Garden. Then there’s design. Designing a vegetable garden is more about which vegetables grow well near each other, than about how things look. Some vegetables will excrete substances that can inhibit other plants growth. Tall vegetables can shade out shorter vegetables. Vegetables in the same family will attract the same pests and need to be moved around each year. Not least to consider, these plants are going to be eaten by you and your loved ones, so if you haven’t given organic gardening much thought before, you might want to consider it now. The good news is that most vegetables have similar growing requirements, so when you are deciding where to put your vegetable garden, you can follow these guidelines. Sun Vegetables are sun lovers. Most will grow their best with 6-8 hours or more of direct sunlight. Leafy greens can handle less sun and crops that prefer cool weather, like lettuce, will continue to grow throughout the summer is shaded by taller plants. But you will still want to choose a full sun location to site your vegetable garden. Access Ideally your vegetable garden should be close to both a source of water and your kitchen. Vegetables will need water on a regular schedule. If they get watered erratically they will exhibit all sorts of problems like cracking open, not setting any fruit at all or becoming prone to cultural problems like blossom end rot.Proximity to the kitchen or at least easily accessibly from some entrance to the house will give you the incentive to remember to water and check on your garden everyday and you’ll be more tempted to run out and pick something fresh while you’re cooking. Soil Soil is the most important factor in any garden and perhaps more so in a vegetable garden. Annual vegetables spend their entire season producing flowers and fruits. They are very heavy feeders and a rich soil will not just keep them growing strong, it will also help ward of disease and pest problems. So for starters, the soil in your vegetable garden will need to be rich in organic matter. Well go into more depth on preparing the soil in a later lesson, but know that you’ll be replenishing with organic matter every year. Compost and composted manure can be added in spring and/or fall. I would also strongly recommend you have your soil tested when starting a new garden. The test results will tell you if any other amendments need to be added and if the soil pH needs to be adjusted.Probably the easiest way to ensure great soil for your vegetable garden is to create raised beds. Raised beds simply mean the soil you are growing in is higher than the ground level by 6 or more inches. You can pile it between paths or create elaborate structures, but raised beds allow you to control the soil in the planting area, it never gets stepped on and compacted, it drains well and it warms up faster in the spring, so you can plant earlier. One final consideration when looking at your soil is to be aware of drainage and run-off. Vegetables don’t like to sit in wet soil, so if your soil is heavy the texture will need to be improved. Hopefully the organic matter will make a dent. You also don’t want all the nutrients you add to simply run off elsewhere. If your site isn’t level, you’ll need to create run-off barriers. Similarly, you don’t want water from less favorable sources, like the driveway, running into your vegetable garden. Organic or Not? Organic gardening got a bad reputation for being more difficult and less successful than gardening with synthetic fertilizers and chemicals. I don’t think either is the case. If you’ve resisted gardening organically in the past, now is a great time to begin because garden centers are finally stocking a wealth of organic gardening products and most of the vegetable gardening information is being written to accommodate organic growers.Organic gardening is actually less time consuming, because the whole point is to prevent problems before they happen. Soil that is rich in organic matter is actually alive with all kinds of organisms that will benefit your plants. Keeping your plants healthy by providing the water, sun and nutrients they need is the fastest way to ward off pests and diseases that favor ailing plants. And choosing plants that are suited to your growing conditions and that have been bred to be disease resistant will keep them healthy. Throughout the lessons I’m going to be approaching vegetable gardening from an organic perspective and I hope you’ll give it a try. Tools Every new activity requires the right tools and gardening is no exception. Vegetable gardening can be broken down into 2 stages: preparing the garden and caring for the plants. To create the garden, you’ll be turning a lot of soil. The basic tools include a: shovel, fork, trowel and maybe a tiller. (I’ll talk more about actually creating the garden in Lesson 2.) Once your plants are growing you’ll need a different set of tools which will include a: hoe, hose and nozzle or some type of irrigation system, stakes, twine and pruners. Fencing One last thing to consider is fencing. Fencing can be an eye sore and a hassle, but you’re not the only creature that enjoys eating vegetables. You will be amazed how fast animals can eat through not just the fruits of your efforts, but the whole leafy planting. It’s an endless battle protecting your vegetable garden without a fence. In fact, you might need fencing both above and below the garden. Many animals will burrow under a fence and some, like prairie dogs, will pop up anywhere. It doesn’t have to be fancy the first year, but I highly recommend some type of fencing.